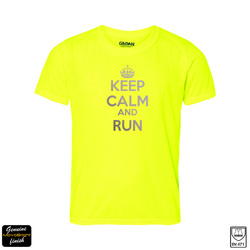 Superb Performance High Visibility Sports T-Shirt featuring reflective text Keep Calm and Run. Official MovoBright reflective material processing. The large reflective text is made from professional grade reflective material and applied using our genuine MovoBright application process. The reflective detail is visible to motorists and other road users from up to 300m away from the front and the rear, making this t-shirt one of the most visible t-shirts available. Suitable for all sports including running, training, exercising, particularly outdoors in low-light hours such as dawn or dusk or dark night time conditions. The t-shirt is very high quality; it washes beautifully time and time again and maintains its original shape. Fabric weight: 153 gsm. Material: 100% polyester. Machine washable.